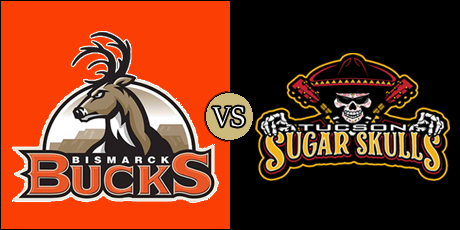 TUCSON, AZ - Matt Behrendt threw for 234 yards and an IFL season high eight touchdowns as the Tucson Sugar Skulls put away the visiting Bismarck Bucks tonight at the Tucson Convention Center. The Sugar Skulls, who led at halftime by a 35-7 score, improved to 2-0 on the season with the win. The Bucks, who were coming off a bye, fell to 0-2. The Bucks actually got on the board when they stopped Nigel Bethel before he was able to return the opening kickoff out of the end zone. The rouge gave them an unconventional looking 1-0 lead. The Sugar Skulls responded with a six-yard strike from Matt Behrendt to Brandon Sampson to go up 7-1 with 10:30 remaining in the opening quarter. The Sugar Skulls extended their lead on Behrendt's 12-yard pass to Donovan Rasberry with 3:24 left in the quarter. Tucson led 14-1 after the end of the first. Bizmarck made it into the end zone two minutes into the second quarter when Homer Causey fired a 13-yard strike over the middle to Frederick Abraham. The Sugar Skulls answered on Behrendt's 26-yard's 26-yard touchdown to Shaq Curenton. After picking off Causey in the end zone, the Sugar Skulls scored again on a 43-yard bomb from Behrendt to Sampson to give Tucson a 28-7 lead with 6:48 left. After forcing a turnover on downs by the Bucks, the Sugar Skulls drove down the field and scored on a four-yard pass from Behrendt to. Rasberry. Bismarck threatened to score, but Causey was tackled short of the end zone on the final play of the half. The Sugar Skulls led 35-7 at intermission. The Bucks capped an eight-play, 31-yard drive with a one-yard plunge by Causey to open the second half. Tucson countered on a 28-yard pass from Behrendt to Curenton to cap off a 11-play, 48-yard drive. Causey's seven-yard strike to Mike Tatum made the score 42-21 at the end of the third quarter. Tucson opened the final quarter with a 13 -yard touchdown pass from Behrendt to Jarid Brown. However, the Bucks were not giving up. They drove down to the four yard line and Tatum rushed around the left sideline for the score. The Sugar Skulls led 49-28 with 9:40 remaining. They added to taht lead when Behrendt found Shadrach Thornton down the right sideline for 17 yards. Bismarck scored on their very next play when Causey found a wide open Brandynn Clark for 30 yards. Thornton put the Sugar Skulls up 62-34 with 2:55 left in the contest before the Bucks tacked on one more score; a 14 yard pass from Causey to Abraham. Tucson was able to run out the clock from there. Tucson amasses an impressive 388 yards of total offense, while Bismarck managed 210. The Sugar Skulls held edges in both passing (234 yards to 130) and rushing (154 yards to 80). The Bucks were penalized nine times for 76 yards, while the Sugar Skulls were flagged 12 times for 107 yards. Behrendt went 19 of 25 for 234 yards with eight touchdowns. The former Green Bay Blizzard QB also rushed 10 times for 72 yards. Thornton gainst 82 yards on 16 carries with a touchdown, and caught three passes for 31 yards and another score. Sampson finished with seven catches for 85 yards and a pair of scores. Curenton and Rasberry each caught two touchdown passes to go along with their 54 and 51 receiving yards, respectively. Zachary Allen led the Sugar Skulls with nine total tackles and a sack, while Cam Gaddis picked off Causey in the first half. Causey finised 11 of 18 for 130 yards with 4 touchdowns and an interception. He also rushed 11 times for 51 yards and a touchdown. Abraham added four receptions for 42 yards to his two touchdown grabs. Tatum had three catches for 28 yards with receiving and rushing touchdowns, while Clark finished with 2 receptions for 59 yards and a score. Khashmere Blakney led the Bucks' defense with 11 total tackles. Next up for the Bucks is their home opener in which they host the Sioux Falls Storm on March 16. Kickoff is set for 4:05 p.m. pacific (6:05 p.m. central). The Sugar Skulls visit in-state rival Arizona Rattlers on March 16 with kickoff scheduled for 5:05 p.m. pacific (7:05 p.m. central).